Successfully Added Ulefone S7 Pro Smartphone - 5.0 inch HD, Android 7.0, MTK6580 Quad Core, 2GB RAM 16GB ROM, 13MP+5MP Dual Rear Cameras - Gold to your Shopping Cart. Remarkable 5 inch screen and 1280x720 resolution hand in hand to generate higher color saturation. TO differentiate between the s7 and the new S7 model with 2GB of RAM and 16GB of ROM.Ulefone will rename the later as S7 pro.On the packing box of the S7 pro, We add the "PRO" icon and remain the "2GB" icon.But when you check your phone model in the settings.It still shows as S7. Smart HiFi Chipset, Phenomenal Audio Experience.--The Ulefone S7 is equipped with the next generation audio chipset AW8737SCSR to deliver unparalleled sound quality. What you hear is as pure as its meant to be. So immerse yourself fully in the fair-sounding melody. 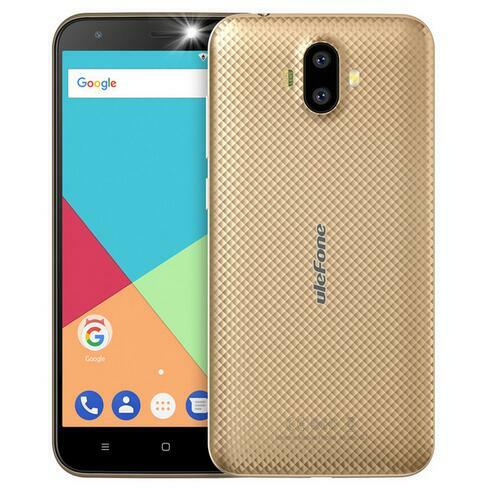 Vibrant 5.0-inch HD Display, Discover A True-to-life World.--The 5.0-inch HD display on the Ulefone S7 renders texts and images with outstanding clarity and vibrant colors whether you are browsing webpages, watching videos or playing games. The world in your palm that brings marvelous visual feast is even far more wonderful than the real one. Unique 3D Surface Texture, Color, Style, Innovation.--To break the stereotyped looks of phones, we boldly adopt the sloping 3D grid design on the back for stereoscopic visual effect. With a single glance, you will be fascinated with the mysterious visual feeling. Its too marvelous for words. Long-lasting 2500mah Battery, Keep You Powered Up Longer.--Ulefone S7 packs a 2500mah battery which guarantees a long service between charges. And in combination with the optimized software, the battery of the S7 makes it possible for you to keep on playing as long as you want without worrying about running out of power. 5MP front camera with softlight, Makes You Always Look Your Best.--The 5MP camera on the front allows you to take perfect selfies with exceptional clarity and vivid colors. Plus, with a softlight for enhanced brightness and fairer skin, you will always look your best. Enjoy the fun and self-expression of selfies more than ever.